The walls between music and visual art continue to crumble around the Capital Region this week. The Trink Gallery at 122 Remsen St. in Cohoes opens its doors with a grand opening reception from 5:30 to 7:30 p.m. Friday. Of particular interest to music fans are the work of two of the Capital Region's finest artists. Photographer Martin Benjamin explores the world of rock 'n' roll with a collection of nearly two dozen photos. Benjamin's work, which appears regularly in Metroland, has also graced the pages of magazines from Rolling Stone to Cosmopolitan. He has exhibited his "Rock Shots" at venues from Albany Center Galleries to the Rock and Roll Hall of Fame. Although he's best known for his black-and-white work, Benjamin unleashes a number of color, 13-by-19-inch "Rock Shots'' for the Trink show. 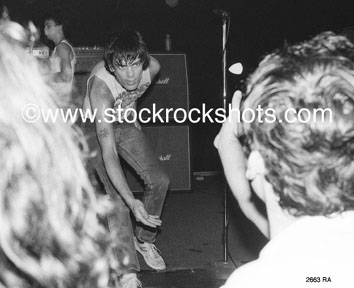 Among the subjects caught in Benjamin's lens are the Kinks' Ray and Dave Davies, Beck, Tom Petty, local heroes the Coal Palace Kings, and even a 1979 vintage shot of Dee Dee Ramone, who is seen tossing a guitar pick to a fan at the long defunct Hulla-Baloo in Rensselaer. The Trink Gallery is open from noon-6 p.m. Wednesday, Saturday and Sunday, or by appointment. The exhibit continues through Sunday, Aug. 11.